What do you do with a leftover egg white? You make a small batch of meringue cookies. I had a leftover egg white from this weekend’s M&M cookies and didn’t want it to go to waste, so I cut down a standard meringue recipe, stirred in some miniature chocolate chips, and pow: chocolate chip meringues. Meringues are both easy and tricky at the same time. They require few ingredients, but a very long mixing time. And for heaven’s sake, don’t try to make them by hand; get yourself a mixer so you can put it on high speed and tidy up your kitchen while the egg whites whip themselves into a cloud of deliciousness. When folding in chocolate chips or coconut or whatever strikes your fancy, do so very gently to preserve the volume of air in the batter. *One-sixteenth? Yep, just fill your 1/4 teaspoon measuring spoon 1/4 full. In a mixing bowl fitted with the whisk attachment, combine egg white, vanilla extract, and cream of tartar. Beat on high speed until soft peaks form (soft peaks curl over). Slowly add sugar, 1 tablespoon at a time, and continue to beat on high speed until stiff peaks form (stiff peaks stand straight up). Gently fold in miniature chocolate chips. Transfer batter to a pastry bag without a tip, or place in a large zip-top bag and snip off one corner. Pipe meringue in circles, making them as large or as small as you like. My batch yielded 8 medium-small cookies. 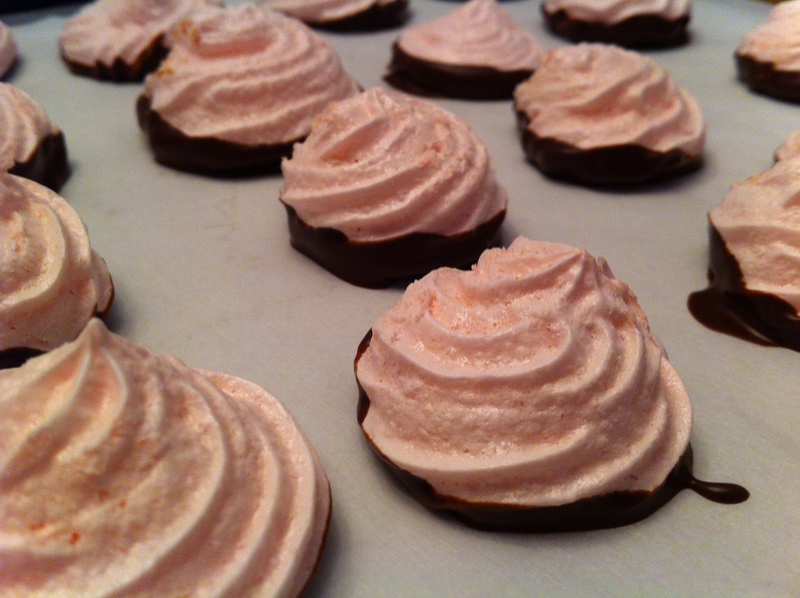 Bake for 20-25 minutes, until meringues are set and bottoms are very light brown. Remove from oven and allow to cool completely on the baking sheet. Store in an airtight container for up to 3 days. Meringue cookies are a great option for using up leftover yolks; they’re easy to make, easy to adapt, and usually gluten-free, depending on what you combine with them. The next time I make these cookies, I’ll do just a few things differently: first, I may bake them another 5 minutes or so, and second, I’ll remove them from the kitchen for cooling. The residual heat from my oven caused these meringues to get sticky within the first few minutes of cooling, which is something I haven’t experienced with meringues before. Despite their stickiness, they’re very nice peppermint treats, both with and without their chocolate enhancement! Preheat oven to 200 degrees. Line several baking sheets with parchment paper. In a mixing bowl, combine egg whites, cream of tartar, peppermint extract, and salt; beat on medium speed until soft peaks form. Slowly add sugar and whip on high speed until stiff peaks form; when whites are approaching stiff peak stage, add red gel paste food coloring to tint. Transfer meringue to a pastry bag fitted with a star tip and pipe 1-inch circles of meringue onto prepared baking sheets. Bake for 1 hour and 15 minutes, until meringues are dry and firm when lightly touched. Transfer meringues to wire racks and cool completely in a cool room. Optional: combine semisweet chocolate chips and shortening in a small saucepan and melt over low heat, stirring constantly. 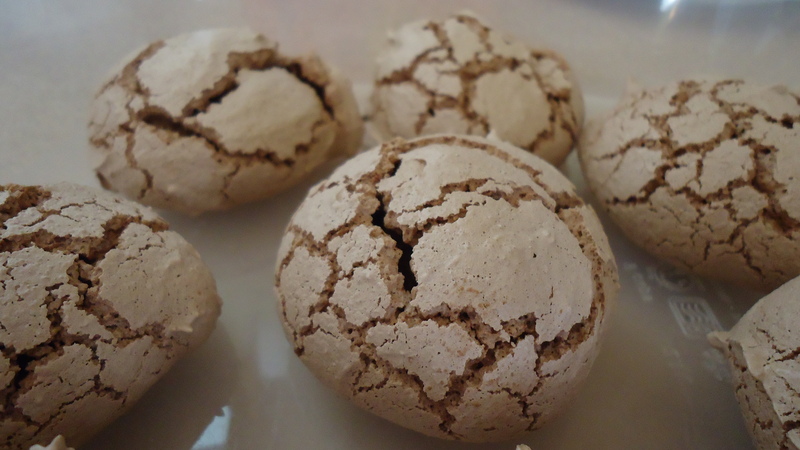 Dip bottoms of meringues in chocolate; place on parchment or waxed paper to harden. Several folks in my life are gluten-free, so it’s been interesting for me to experiment with gluten-free baking. Thus far, my gluten-free endeavors have centered in the macaroon/meringue world, including today’s dark chocolate meringues, but I do hope to branch out into non-wheat-based flours in the New Year. I’ll admit that this recipe needs some work; it’s adapted from Ron Ben-Israel’s dark chocolate meringue recipe that was part of this year’s Food Network 12 Days of Cookies. And although I’m a huge fan of dark chocolate, this cookie is a bit too bitter even for me. 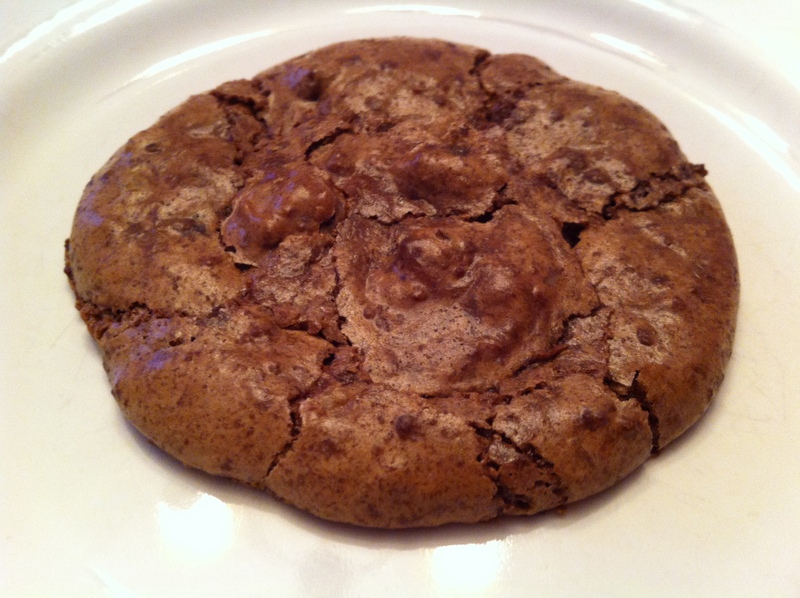 I’m not sure how to tone down the bite in this cookie, but I’m certainly open to suggestions; so far I’m considering increasing the amount of nuts and perhaps using pecans instead of walnuts, and maybe using a blend of milk and dark chocolates, rather than all dark. This is the beauty of baking, though…the possibilities are endless! Place salt, vinegar, and egg whites in a mixing bowl fitted with a whisk attachment and mix on medium speed until whites are foamy, about 1 minute. Add sugar in a steady stream with the mixer running and allow whites to whip to stiff peaks, about 4-5 minutes. Stir about one-third of the whipped whites into the chocolate, then fold the combined whites/chocolate mixture into the remaining whites. It’s important to note that you want to keep the mixture as light as possible, but you do need to fold more firmly than you would normally in order to incorporate the chocolate mixture properly. Fold in walnuts, then place the dough into a large resealable plastic bag (or pastry bag), snip off one corner, and pipe the dough in 1 1/2 inch circles on the parchment-lined baking sheets. Bake both batches at once, for about 12 minutes. Cookies are done when the tops are shiny and cracked. Allow to cool for 10 minutes on baking sheets, then cool completely on a wire rack. What does one do with leftover egg whites from yesterday’s yolk-only hamantaschen? She makes meringues! Meringues are simple ingredient-wise, but they definitely take patience. Whipping egg whites to stiff peaks can take upwards of 10 minutes, depending on your mixer, so this isn’t a recipe you can rush. The result, though, is a light, airy, fluffy cookie that is definitely worth the time. In a small bowl, combine sugar and cocoa powder; set aside. In a mixing bowl, beat together egg whites, vanilla, and cream of tartar until soft peaks form. With the mixer running on medium speed, add sugar/cocoa mix, one tablespoon at a time, until combined, gently scraping the sides of the bowl as necessary. Continue beating at high speed until stiff peaks form. Drop by rounded teaspoons, spacing about two inches apart. Bake for 20-22 minutes, until bottoms are very light brown.